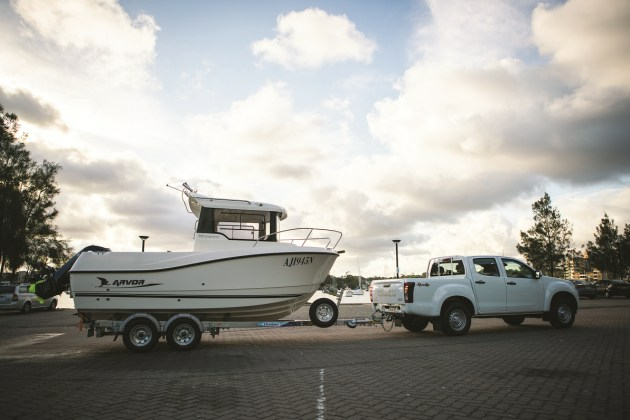 Arvor has produced an easily towable, enclosed cabin fishing boat squeezed into a 5.5 m package. ARVOR is a familiar boat brand to many Australians. I see them everywhere, mostly around my home waters of Sydney Harbour and Pittwater. They’re an iconic boat and loved by many keen boaters across the country. A few years back the brand unveiled its Sportsfish range. The range was geared more towards fishos and featured outboards instead of Arvor’s traditional diesel shaftdrive engines. Outboards are more familiar to the average fisho and the clear deck space was most welcome. The new range also featured plenty of other fishing friendly additions. While the Sportsfish range ticked many boxes, what Arvor was missing was a legally trailerable model. 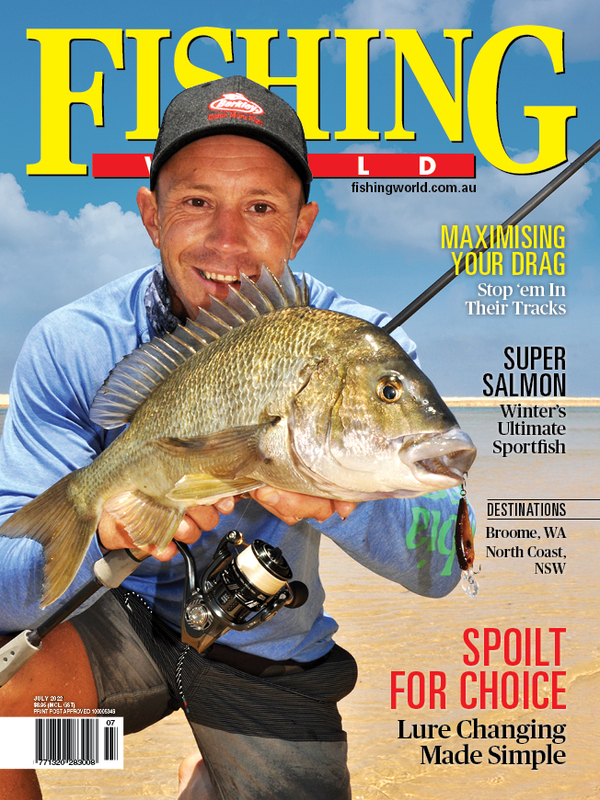 Let’s face it, Aussie boat owners and fishos love hooking up their boat, hitting the road, and going fishing. The majority of boats around this country are on trailers; it’s often more affordable and there’s more flexibility where you can launch them. The 555 Sportsfish answers those needs in a simple towable package. 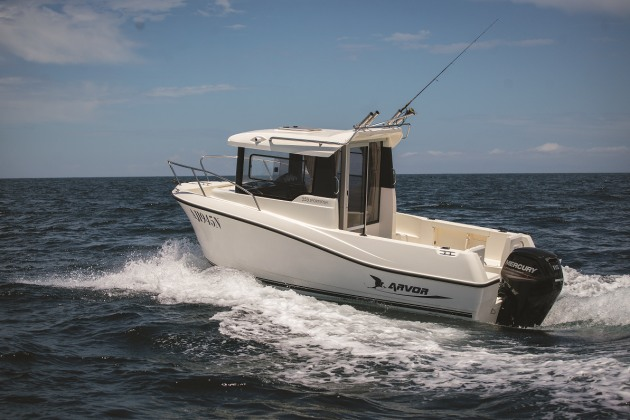 The Arvor 555 is an all-round fishing boat. I’d place the 555 in the all-round fishing boat category. It would also make a great family boat with its huge enclosed cabin (more on that later). 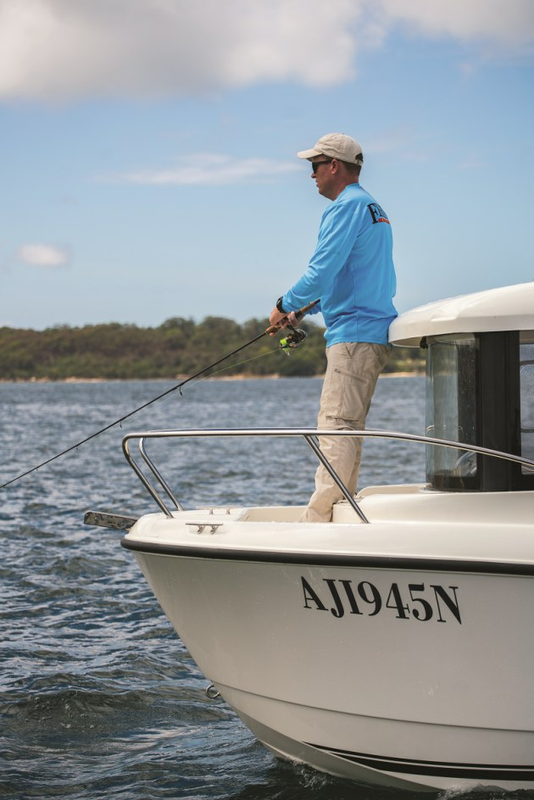 The 555 would appeal to those who enjoy fishing harbours, bays, estuaries and occasionally offshore. With its self-draining deck and enclosed cabin it’s a safe boat in bad weather. It will keep you dry if the weather does turn pear-shaped. That said, the 555’s relatively gentle deadrise, while keeping the boat stable, may not provide an ultra soft ride if you intent to make long runs offshore in rough conditions. However, for most applications the Sportsfish gave a good account of itself during Boat Fishing's test. On the water Arvor’s Collin’s Marine provided Boat Fishing with the 555 for an extended test, a couple of days on Sydney Harbour. This allowed us to genuinely experience the boat and catch a few fish along the way. After a quick launch in the Parramatta River we pointed the boat towards Sydney Heads, hoping to see some fishing action. Unfortunately the fishing was slow offshore, but it did allow us the opportunity to test the boat in a moderate sea. The enclosed cabin provided excellent protection from any wayward spray and wind and allowed us to push through the chop with ease. Enclosed cabins can be misleading when it comes to boat speed; being protected “inside” makes it feel slower, but our cruising speed around the heads and inside Sydney Harbour was around 21 knots and 4000 rpm. We left the heads and found some fish in calmer conditions inside the Harbour. The cockpit area allows two to three anglers enough space to fish in comfort. For day one we had two onboard and three fishos on the second day. With three onboard, lure casting become a squeeze out the back, but in the calmer conditions we took advantage of the bow casting area, which allowed one fisho a great vantage point while the other two remained down the back. Access to the bow is easy thanks to Arvor’s offset cabin, which opens up additional walking space on the starboard side. The 555 is a beamy boat and stability was excellent. It did feel a little “tippy” sometimes because of the large top heavy cabin, but overall with three people onboard it featured excellent stability for a 5.5 m boat. In the calmer conditions we took advantage of the bow casting area. Arvor comes from the same parent company as Mercury, so it’s no surprise to see a Merc on the transom. It’s also a positive feature of a boat because you know it’s well matched and the maximum horsepower reflects the boat accurately. It was a surprise to see the maximum horsepower as 115 hp for what’s a physically large boat. However the powerful Mercury was more than adequate for the 555. Once on the plane, the Merc found a sweet spot between 20 and 25 knots which handled the harbour chop and boat wash without any problems. Wide open we reached 32 knots @5100 RPM. That’s more than adequate in this boat. The 555 includes a host of fishing friendly features. Starting from the transom there’s a small port-side livewell. The boat has plenty of rod holders in the gunwale and in the rocket launchers above the cabin. There are also some horizontal rod holders under both gunwales for storing short rigged outfits. Of course, it takes more than a few holders to make a fishing boat. Importantly, while the deck space isn’t huge, as mentioned above, it comfortably fishes two people out the back. The gunwales are nice and high, so you feel safe, and the self draining deck ensures water disperses quickly keeping the deck dry. The helm area is neat and the dash features enough space for a 10-inch sounder. Further forward you’ll find a large kill tank just behind the cabin’s sliding door. Fishos will appreciate the ease of access to the bow, thanks to Arvor’s offset cabin, as mentioned above. I wouldn’t fish up there in rough weather, but we found it offered a great vantage point and a clutter free fishing platform. Inside the cabin you notice the enormous cushioned bunk area. For a boat only 5.5 m long, it’s incredible how much space is available. This is thanks to the boat’s bow extending quite far forward, opening up substantial space in the cabin. The cabin would make a great spot for kids to take a nap, or to use as a sneaky overnighter with the other half. There are two bolster seats and a removable floor which allows standing room for the driver, but not the passenger. There’s also an additional attachment which makes a third seat in the middle. This would be useful for long runs during cold weather when all onboard are inside. Spray does creep into the cockpit while at speed, so having all passengers inside the cabin is a good idea. The helm area is neat and the dash features enough space for a 10-inch sounder. 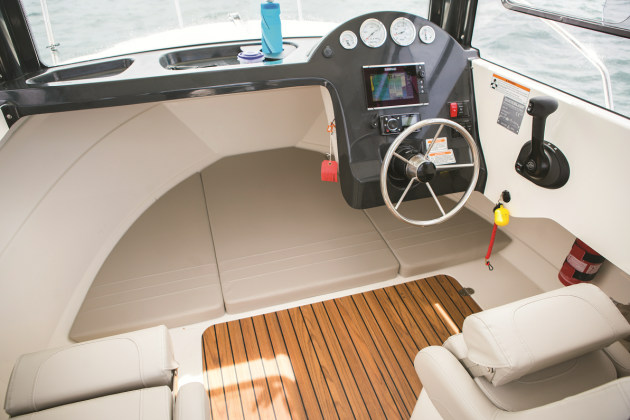 The test boat had a 7-inch Simrad, plus a Fusion stereo, gauges, and 12 volt plug. There’s plenty of space above the dash for throwing sunnies, sunscreen or other nicknacks. Boat Fishing tested the 555 on a hot summer’s day, and as such, really appreciated the sliding windows and roof hatch for airflow. Even with the cabin sliding door shut, it still cooled things down to a comfortable level. Another feature for hot summer days is the slide out awning over the cockpit. We didn’t use it, given it would impede on fishing space, however it would be a useful feature for adding shade or keeping dry in rain. At just over 1.8 tonne and only 2.4 m wide, the Arvor 555 is quite easy to tow. As mentioned above, the unique feature of Arvor’s 555 Sportsfish is that it’s trailerable. At just over 1.8 tonne and only 2.4 m wide, it’s actually quite easy to tow. We used a Isuzu Dmax with a towing capacity of 3.5-tonne. It was a breeze to tow; actually it was easy to forget there was anything attached! Some family SUVs and sedans with towing capacities around 2100 kg would also be capable of towing the 555, and that’s a credit to Arvor. Not only is the weight kept to a minimum, but it was surprisingly aerodynamic for such a “boxy” looking boat. I towed the 555 from Sydney to the Blue Mountains and back again along freeways and found fuel usage on the Isuzu excellent. Being under 2-tonne, you won’t need electric brakes, so it’s a simple and affordable set up. As tested, the 555 Sportsfish comes in at $77,000. That’s great value given it was kitted out with plenty of accessories and fishing pack and was a complete ready-to-fish package. The basic starting price is $58,950, plus trailer if you wanted to customise your own rig. All up, the 555 Sportsfish offers a unique enclosed cabin boat in a small easily manageable package. I can’t think of too many enclosed cabins at 5.5metres, and especially ones which can be towed behind a family car! 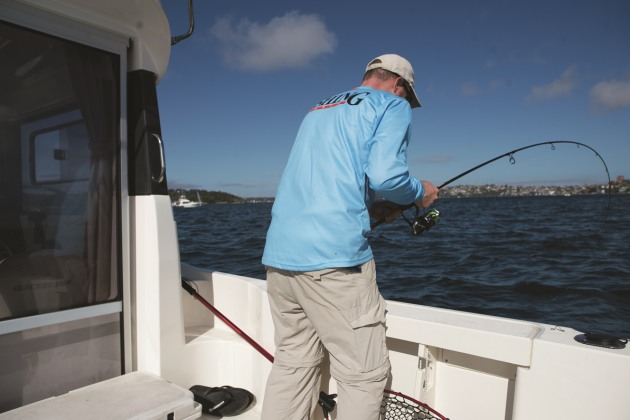 The enclosed cabin and relatively shallow deadrise comes with some compromises for the serious offshore fisho, but as an all-rounder, and crossover fishing/family boat, the 555 Sportsfish would make a great affordable package. More information and to find your nearest dealer, click HERE, or to watch a Fishing World video about the Arvor 555, click HERE.